Fun at Joe’s Bar(mitzvah) – CARICATURES AND COMEDY stuffed in a lovable, scrawny alleged member of humanity! 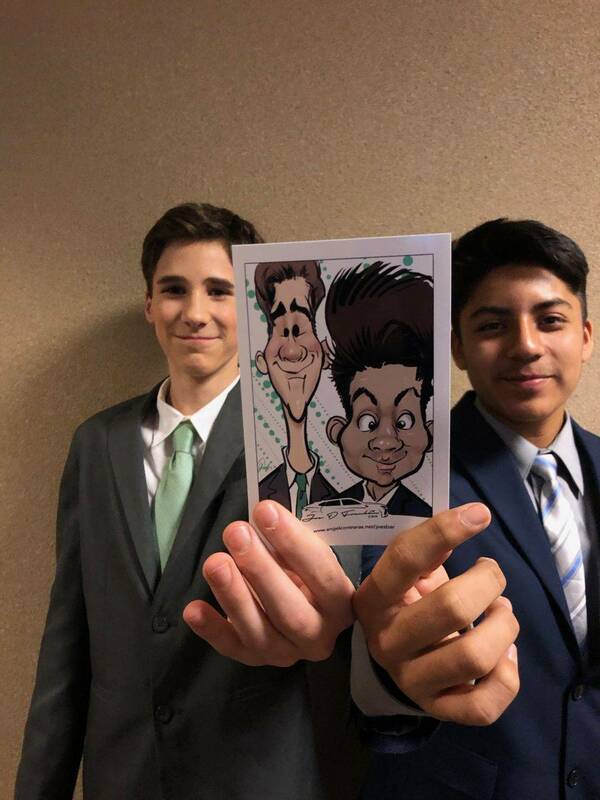 Angel had a wonderful time at the Park Center in Glenview, Il drawing digital caricatures for Joe Franklin’s Bar Mitzvah. Bar(Bat) Mitzvah’s are a precious tradition among Jewish people. A milestone in the life of a Jewish child usually on the first Shabbat nearest to the child’s 13th birthday . (some traditions allowed for the female to be “Mitzvah”ed at her 12th. Religious Jewish people consider it the time when the boy becomes a man. The newly minted man is bears the responsibility before the congregation and God to obey and revere God’s Law as written in the Torah. While “reform” Jewish persons consider it more of a “coming of age” celebration. This celebration if filled with music, testimonials, dancing and, often…lots and lots of sugar! It was an honor for Angel, as a Christian goyem to join in the fun and draw these great kids!